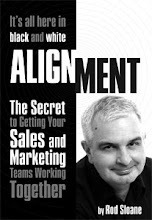 Sales and Marketing Alignment Blog from Rod Sloane: Do you need to change the way you market and sell your services in 2010? Do you need to change the way you market and sell your services in 2010? "Given the current economic climate do you think that companies need to review and change the way they market and sell their products and services?" Yes, let’s face it prospects are now better informed than ever before, they can go and speak to your existing and past customers relatively easily. They have often formed an opinion about what you offer way before you enter into dialogue with them. What can you do? We all need to market smarter, more often . A good place to start is with your marketing plan, you do have a marketing plan don’t you? Jeremy Nicholas interviews me about "Alignment"